Lakeland Plastics offers a state of the art tool room, complete with 5 axis wire EDM and CNC machining centers. All tooling is designed, engineered and tested under the watchful eyes of our experienced technical team. Using the latest technologies, they will work closely with you to design the plastic extrusion tooling that will meet the exacting needs of our customer while improving productivity, safety, efficiency and reducing costs. Lakeland Plastics helps you design the custom plastic extrusion tooling for maximum efficiency then produces a die that will ensure your part can be produced at the high speeds required to be competitive in today’s competitive global marketplace. Our state of the art tool room also manufactures vacuum calibrators, cutter bushings, fabrication fixtures and other items required to produce your custom extrusion. Since we make all of our tooling in-house, we retain complete control over the process and can rapidly make any changes that may be necessary to maximize production and at the lowest possible cost. Our tooling engineers have extensive knowledge as well as many years of experience in the production of streamlined plastic extrusion tooling. 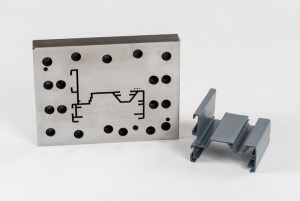 Whether your part is going to be vacuum calibrated or run on an air rack or into a water trough, Lakeland’s tooling engineers can make the tooling required to produce the highest quality plastic extrusions. Our tool room also produces the custom, job specific quality control measurement gauges necessary for our production team to properly inspect your part as it is produced. Lakeland’s tool room can operate 24 hours a day to help expedite the time required to produce your tooling and get it ready for production.